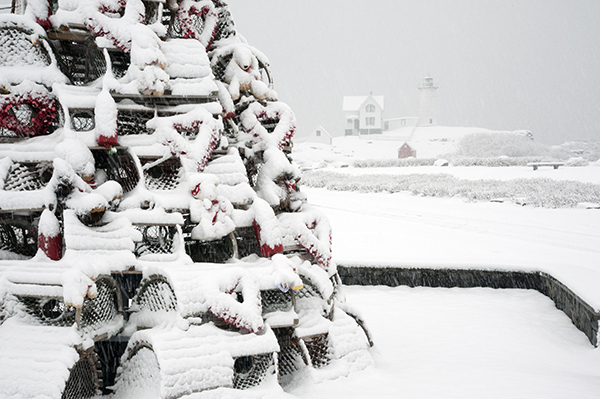 Lobster trap Christmas tree overlooks Nubble (Cape Neddick) lighthouse in Maine. There’s a new tradition sprouting along the New England seacoast for a little more than the past decade. Coastal communities are engaged in friendly competition in building holiday Christmas trees made of either old fashioned wooden lobster traps and fishing gear, or wireframe lobster traps and gear. Some communities boast having the tallest, some the most decorative, while most are just happy to create a local joyous tourist site, honoring those that make a living by the sea. Decorated traps are erected into a large familiar conical shape, and most are lit at night for visitors to enjoy. The tradition is believed to have started in 2001 at America’s oldest fishing port, Gloucester, Massachusetts. The story goes that a local shopkeeper was frustrated that Main Street had no holiday display. She noticed a tiny lobster trap tree on someone’s yard, and decided to gather community members together to erect a large lobster trap tree downtown. The entire community came together on this project as local lobstermen in the community donated over 350 traps, while many fishermen donated buoys, which were painted red for the season by local school children. The traps are stacked and decorated by local volunteers, and even the fire department was involved in putting on the star with their hook and ladder truck. When the city of Rockland, Maine, known as the lobster capital of the world, heard of this event, they decided to create a holiday “lobster trap tree” of their own version in 2003. For the tree they decided to use lobster pots as well. They hired Brooks Trap Mill in nearby Thomaston to build and supply over 150 colored lobster traps to be built specifically for the 30-foot tree, which is decorated with nearly 500 feet of garland, and has an 8-foot fiberglass lobster placed on top. Most of the assembly of the tree, which is lit from inside, not from lights draped on the outside, is done with the help of local Coast Guard volunteers. Each year, Rockland’s ceremony involves Santa Claus lighting the tree with help from the winner of the annual Maine Lobster Festival Sea Goddess pageant. The town of Beals Island, Maine, boasts as having the tallest lobster trap holiday tree at 60 feet in height, located near the Moosabec Reach from Jonesport. This tree consists of nearly 1,400 wireframe traps. 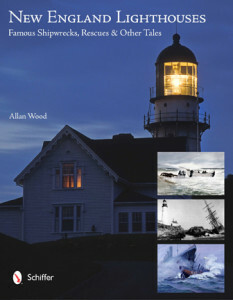 Each holiday season, the town of York, in Maine, has a “Lighting of the Nubble” ceremony where Cape Neddick lighthouse, often referred to as Nubble light, is decorated and remains lit each night during the holiday season. 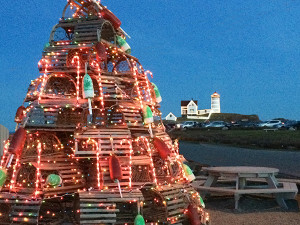 What visitors will find unique, is that a wooden lobster trap tree has also been erected over the past few years in the nearby Fox’s Lobster House restaurant. Visitors can now view the lit Christmas lobster trap tree with the lighted Nubble lighthouse in the background. Like countless other communities across the country, large Christmas trees are erected in public gathering spots to give area residents a place to come together to celebrate the holiday. 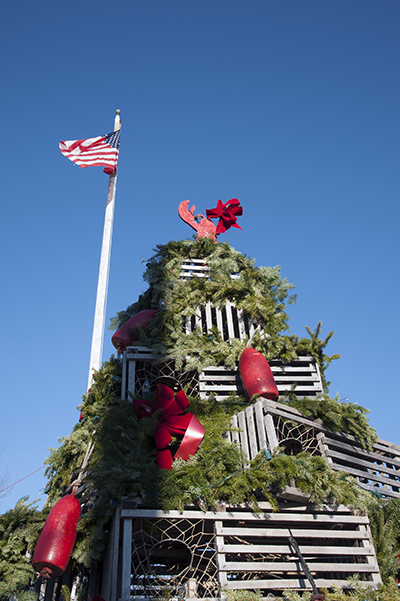 In many of New England’s coastal fishing communities, instead of using actual trees, they are now building these lobster trap trees as a new tradition. Gloucester has taken the experience a step further and has recently involved the Jewish community to celebrate the holiday spirit by erecting the first “lobster trap Menorah,” outside Temple Ahavat Achim. The 14-foot-tall, 20-foot-wide menorah is made of 22 lobster traps, with nine buoys that represent the candles, and plenty of decorated lights. No matter what your religious faith, happy holidays to everyone, and to everyone a safe and fruitful new year.